As people throughout the world turn a more attentive eye to the environment, new ways to promote sustainable living become popular. But some environmentally friendly methods of reducing the old carbon footprint have been around for ages. Take composting for example. This type of recycling is an extension of what occurs naturally, and it is has been practiced by many people for about as long as there has been waste itself. Soil conditioning. Lawns and gardens require a healthy amount of humus – organic matter comprised of decomposed waste – in order to thrive. Composting provides this humus, which in turn provides moisture for plants and nutrients for soil. Household waste management. Composting is a great way to curb excess waste. Through composting, some homes divert up to 30% of their total garbage away from the can and into the ground. Positive environmental impact. With composting, there’s no need for harsh chemical-based fertilizers that can be harmful. Also, composting cuts down on landfill waste. But even though the act of composting is an overall good, it does have certain drawbacks, like that certain odor that always seems to permeate the area afterwards. Compost is waste, and thus is going to end up smelling like waste. But for those who feel helpless in the face of the sweet stench of compost can take heart: there are practical ways to get rid of compost smell once and for all. Oxygenate the compost. Compost can quickly stagnate and turn foul without air. Use a shovel or other tool (depending on the size of the compost bin) to stir the compost and move the contents on the bottom to the top. This task should be performed once or twice a month. Keep the compost dry. According to professionals, a low moisture content (40-60%) is key to proper management. Squeezing the material and looking for excess moisture is a good way to determine if the compost is too wet. Mix Smelleze™ Natural Composting Odor Treatment Granules with the compost. This has been recommended by a number of environmental organizations and works to curb strong decomposition smells. The amount of granules to use depends on the size of the compost bin and can be varied to match the stench. 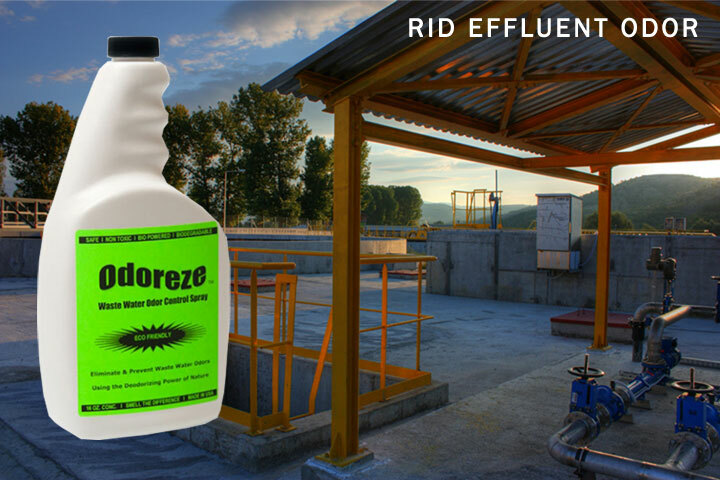 If you prefer a liquid spray instead of granules, consider using ODOREZE™ Bio Based Compost Smell Eliminator. This comes as a super concentrate and one 32 ounze bottle is enough to make over 60 gallons so doesn’t take up much shelf space and works well. Keep the compost balanced. Oftentimes the foul odor produced by composting has a strong ammonia-like quality to it. This is due to an imbalance of nitrogen-rich and carbon-rich materials in the pile. Examples of nitrogen-rich materials include food waste and lawn clippings. If the compost pile is made up exclusively of these types of materials, it’s going to smell pretty bad. Offset the stench by adding more carbon-rich materials such as coffee filters and eggshells. Dried leaves also make great additions to an odorless compost heap. If this is not enough, use a commercial grade ammonia remover such as AMMOSORB™ Ammonia Removal Granules which is very effective and also eco-friendly. By following the above steps anyone should be able to get their compost pile in top aromatic shape without having to put up stinky compost. And the reward for this extra work will pay dividends in the form of healthy lawns and gardens. Jim Pinneo is the owner and operator of Black Knight Termite and Pest Control, a Pest Control Temecula company in Southern California, serving the area for over 20 years.